Little kids just love food! Sometimes it gets in their mouth...and it definitely always gets on their clothes. But the great thing about this shirt is those inevitable stains really just compliment the whole theme here. 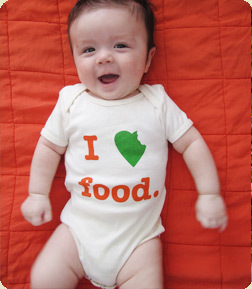 Your little bundle probably has an appetite so get 'em a really cute shirt to match!